The summer is beginning to ramp up, which means we are fully booked from now until mid-July. Weddings, bachelorette parties, friends visiting, family visiting, conferences – our weekends are busy. Beyond that, we are trying really hard to not plan anything for the rest of the summer. It’s tough. I already have light suggestions in my calendar for what we might want to do, but for our first summer in New York, I want to maintain some semblance of flexibility to explore the city in which we live. Eric and I have started building up a bit of a routine to our explorations as well. Saturdays usually include a one-way long run – 8-10 miles to a destination that most often includes food and beer. With the weather having been so lovely lately, these one-way runs often turn into all-day patio-hopping endeavors. It’s fun. Sundays we switch it up with a bike ride to some of the farther-flung places: breweries, parks, other boroughs. We’ve found some good biking routes around the city and we certainly get our hill work in with the number of bridges we must cross on our rides. So this soup – it’s tasty. Spicy. Perfect for a hot day. You can use a chicken egg instead of a quail egg, though quail eggs are cuter. And you can skip the ramps if they’re no longer in season. Or add other greens if you want to amp up the health factor. 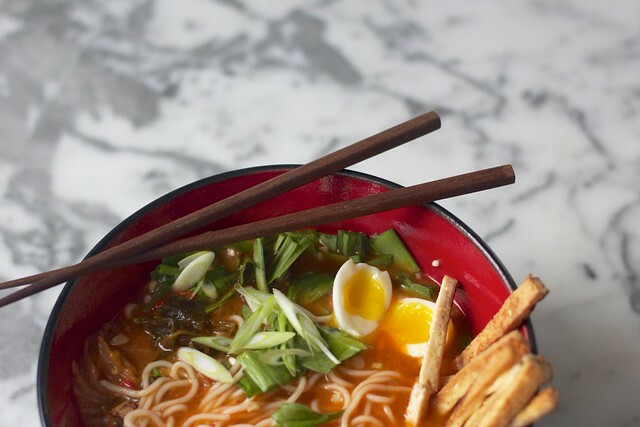 Compared to most hot soups, you don’t want a fatty broth here – the fat will congeal when you chill the broth, making it rather unappetizing – so if you’re making your own, remember to skim the fat before you use it. The tofu fries add a nice crunch and texture and frankly just taste good. Slurp these up before a big bike-riding, patio-hopping, beer-drinking day. To make the broth, start by sautéing the garlic and ginger in oil over medium-high heat for 1-2 minutes, until very fragrant. Add the chicken stock and gochujang and allow to come to a boil, whisking to incorporate the gochujang. Turn off heat and add the kimchi with plenty of its juices and rice vinegar. Make sure the ice water is ready, then add the ramps, stir so they are all submerged, then immediately add the ice water. Taste for seasoning – add salt if necessary. Put the pot in the refrigerator or the freezer if you want it to chill faster. Make your noodles according to package directions until al dente. In a frying pan, fry to tofu strips in oil over medium-high heat until crispy on the outside. You might need to do this in batches. For soft boiled quail eggs, bring a pot of water to boil, drop the eggs in and set the timer for two minutes. After two minutes, remove from hot water and submerge them in ice water. 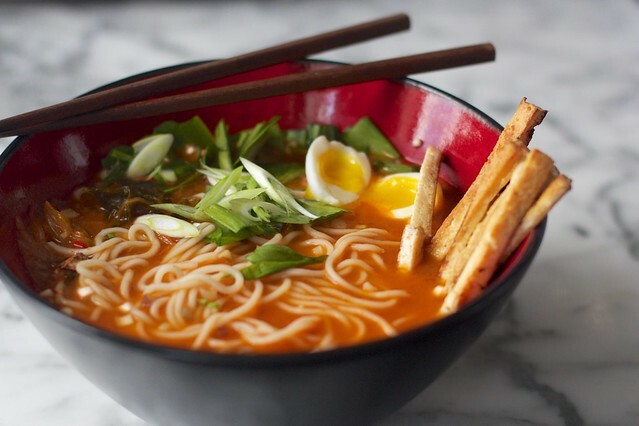 To assemble, layer the the noodles, tofu, green onions, quail eggs (peeled and cut in half), and red chile in a deep bowl. 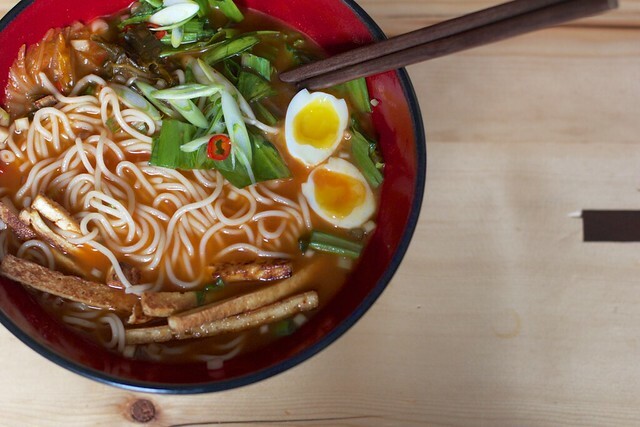 Pour the chilled broth with kimchi and ramps over the top. Slurp to enjoy.